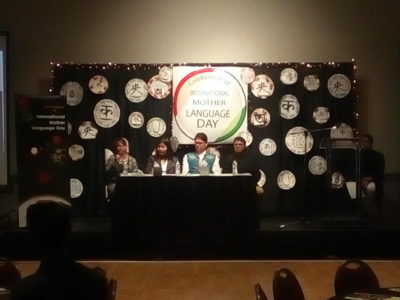 In celebration of International Mother Language Day, Bangladesh Cultural Association of Kamloops (BCA) in conjunction with TRU Aboriginal Affairs, hosted an open panel discussion and cultural showcase dinner in the Grand Hall of the Campus Activity Centre on Feb. 15. The panellists included faculty members of TRU who spoke about the origins of their native languages and their relation to the preservation of their respective cultures, under the theme: The Importance of Mother Language and Cultural Preservation. The event was one of many around the world celebrating International Mother Language Day, which commemorates the date when students were shot and killed in Dhaka in 1952, after demonstrating for Bangla to be recognized as one of the two national languages of Pakistan. The first panellist Hafiz Rahman, president of the BCA and associate professor in the school of business and economics, stated that language is an intimate expression of culture. He added that language and culture share a unique relationship because a culture’s beliefs and customs often lose some of its expression when it is translated or removed from its original context. Rahman also stated that while there are benefits of living in a multicultural society, it can make preserving individual cultures challenging for minority groups. Sharing his thoughts, Paul Michel, director of Aboriginal Affairs at TRU, said that many Indigenous people can relate to the BCA’s efforts because Indigenous peoples also work hard to preserve their languages. Referencing the number of native languages shared among Indigenous people across Canada, Michel encouraged people to make the effort to learn more about Indigenous peoples and their cultures. “Please refer and ask Indigenous people where they’re from. We’re not generic, we are very much diverse,” he explained. June Kelly, a member of the Secwepemc nation and coordinator for the First Nation Language programme in the school of education, added that the university gives students the opportunity to study Secwépemc and St’át’imc; two of many Indigenous languages. Closing the discussion, Gloria Ramirez, associate professor in education and social work, said when she asked people how they would feel to be in a world where no one spoke their language, they told her they would be lonely, frustrated and scared. Following the panel discussion, guests were invited to indulge in Indian-style tacos and vegetarian samosas in a buffet style dinner. The event also featured performances from TRU students, who showcased their unique cultures. Last week’s celebration marked the third annual commemoration of International Mother Language Day at TRU. Musfiq Rahman, general secretary of the BCA and an associate professor at TRU, explained that the main purpose of the day was to “promote multiculturalism and linguistic and cultural diversity” as well as protect native languages.